Formed as a Bay Area punk rock band called Asbestosdeath, the band changed their musical direction and name and debuted as Sleep with their "Volume One" album in 1991. After Justin Marler left the band, the core lineup of Al Cisneros, Matt Pike and Chris Hakius went into the studio to record a demo cassette that they sent to Earache Records. The recording was released in November 1992 (exactly as received by the label) under the name "Sleep's Holy Mountain" and went on to forever alter the musical landscape. Countless current bands cite "...Holy Mountain" as a major inspiration, and the unique sound and style of the record can be heard in many subsequent releases by bands from all over the world. "Sleep's Holy Mountain" created such a buzz that major label London Records signed the band. Unfortunately, the label lacked the vision necessary to actually follow through and release the album that Sleep recorded, mostly because it took the not-radio-friendly form of a Single song -- a 63 minute long ode to weed -- called "Dopesmoker." Sleep returned to the studio and edited the track down to 52 minutes and retitled it "Jerusalem", but it was again rejected. London Records shelved the record and dropped the band, leading to their dissolution. Luckily, the record had a life after death and refused to stay buried. It first saw the light of day as the shortened "Jerusalem" version by The Music Cartel in 1998 before "Dopesmoker" (at its full 63 minute length) was given a proper release by Tee Pee Records in 2003. "Dopesmoker" stands as one of the towering achievements in recent metal history, a mesmerizing, intoxicating, and incredibly complex song that is still unrivaled in the annals of stoner metal. The band's breakup, while devastating for fans, turned out to have a silver lining as Matt Pike went on to form High On Fire, a metal juggernaut that has authored five albums to date, and Al Cisneros went on to form OM who have released four albums to date. 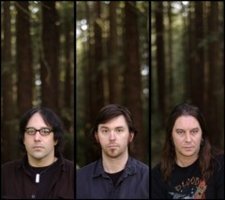 SLEEP features Al Cisneros (bass / vocals), Matt Pike (guitar) and Jason Roeder (drums).